In Saving the Media: Capitalism, Crowdfunding, and Democracy Julia Cagé explains the economics and history of the media crisis in Europe and America, and presents a bold solution. But it’s not just here. The media is in crisis everywhere. Confronted by growing competition and falling advertising revenue,news operations in print, on radio and TV, and even online are struggling to reinvent themselves. For many, the answer has been to lay off reporters, join conglomerates and lean more heavily on generic content. One of the most severely hit areas is investigative journalism, meaning the media is less able to hold politicians and government accountable. The result: in a world awash with information, news organisations provide citizens with less in-depth reporting and a narrowing range of viewpoints. In her new book Julia Cagé explains the economics and history of the media crisis in Europe and America, and she presents a bold solution. The answer, she says, is a new business model: a non-profit media organisation, midway between a foundation and a joint stock company. Cagé shows how this model would enable the media to operate independently, relying instead on readers, employees and innovative methods of financing, including crowdfunding.Cagé’s prototype is designed to offer new ways to share and transmit power. It meets the challenges of the digital revolution and the realities of the 21st century, inspired by a central idea: that news, like education, is a public good. Saving the Media will be a key document in a debate whose stakes are nothing less crucial than the vitality of democracy. Bella Caledonia: What’s at the heart of the media crisis? Julia Cagé : First of all, there is the decline in advertising revenues. This is a long-term decline, that began at the end of the 50’s. The continuous increase in media competition (today with Internet but historically first with radio and TV) has lead to an decrease in advertising prices. The media, in particular in the US where newspapers have relied much more than in other countries on advertising revenues, need to find a new business model. Second, faced with the decline in advertising revenues, media outlets have made the choice to decrease the size of the newsrooms, even when they were still making profits. The race for higher profits – at the expense of the quality of information produced by newspapers – is also at the heart of the crisis. Media outlets have entered into a vicious cycle: less revenues – less expenses – less journalists – lower quality – less readers – less revenues (both from sales and advertising). But they could have made different choices, especially by choosing the nonprofit model. Bella Caledonia: You outline a new model, the NMO, Non Profit Media organisation. Can you explain what that is and how it works? Julia Cagé : The nonprofit media organization (NMO) I propose in the book is a hybrid model. It is inspired in part by the model of foundations used by many international universities, which combine commercial and noncommercial activities (they rely on a complex combination of tuitions, research grants, donations and government funding). But there is more to it than that. One goal is to secure permanent financing for the media by freezing their capital. A second goal is to limit the decision-making power of outside shareholders with constraining bylaws. First, the NMO, as a nonprofit corporation, pays no dividends, and shareholders cannot recover their investments (as in the case of a foundation). Like a foundation, it can accept unlimited gifts. Any physical or moral person can contribute – in particular readers and employees. Such gifts are to be tax-deductible, as gifts to foundations currently are. Second, in the NMO, some additional power is granted to small contributors, who are regarded as participants in the management of the firm and not mere donors. More precisely, the law should specify that any investment above a certain threshold of capital share of an NMO would bring a less than proportional share of voting rights. For example, investments above 10 percent of capital might yield only an additional one-third of a vote per share. Conversely, small investors, who contribute less than 10 percent of the company’s capital, would receive a proportionate boost in their voting rights so that the total is always 100 percent. A major advantage of the NMO model is that it allows readers and employees to participate in the firm as crowdfunders and to exercise a voice in its management. Readers and employees obtain voting rights and act as true shareholders. Hence the media can be reappropriated by those who produce and consume the news rather than by those who seek to shape public opinion or to use their money to influence our votes and our decisions. Bella Caledonia: You’ve been criticised for focusing too much on print journalism – how do you respond to that? Julia Cagé : I don’t think that I focus too much in the book on print journalism. I rely a lot on history because I think that understanding the long-run history of the media is useful to make proposals for the future of the industry. And obviously historically, online journalism did not exist. But I discuss online journalism in the book, the necessity of introducing paywalls, the fact that Google, Facebook, Amazon and the others are capturing the main share of the online advertising market; the production of information in the online world… The proposal I make – the NMO – is also a digital proposal since I highlight the importance of crowdfunding. I think that those that reproach me with focusing too much on print think they can make a clean break with the history of the media. On the contrary, I believe that we need history. Bella Caledonia: Isn’t there another possibility that, rather than an enlightened approach of subsidy and long-term investment we will just go down the road of increased sensationalism and celebrity culture, in addition to the media fragmentation of 1 billion blogs? Julia Cagé : Yes, there is such a risk. And this is one of the reasons why I wrote this book and I called it “Saving the media”. Because if nothing is done we may just go down the road of increased sensationalism and celebrity culture, with less and less investment in high-quality journalism. Also because I think that media independence is increasingly at risk, which appears clearly when one investigates the new ownership structure of the main general information media outlets. Bella Caledonia: Can you describe the media situation in France and how it difference from Britain? Julia Cagé : A lot of things are different between the two countries! But they both suffer from the media crisis and it appears clearly not only when we look at the revenue figures, but also when we investigate the long-run evolution of the size of the newsrooms. The importance of Murdoch is obviously a Britain specificity. As well as the fact in Britain there is one media outlet that is a foundation, the Guardian. There is no foundation in the media industry in France. I could highlight a number of other important differences between Britain and France, for example the fact that newspapers are cheaper in Britain, with a much higher circulation per capita; also the fact that they tend to a be a little bit more “trashy”. But the risks I underline in my book – decline in quality, race for higher profits; risks for media independence,… – the media industry faces them in both countries. And so the solution I offer – the Nonprofit Media Organization – could also be used in both countries. 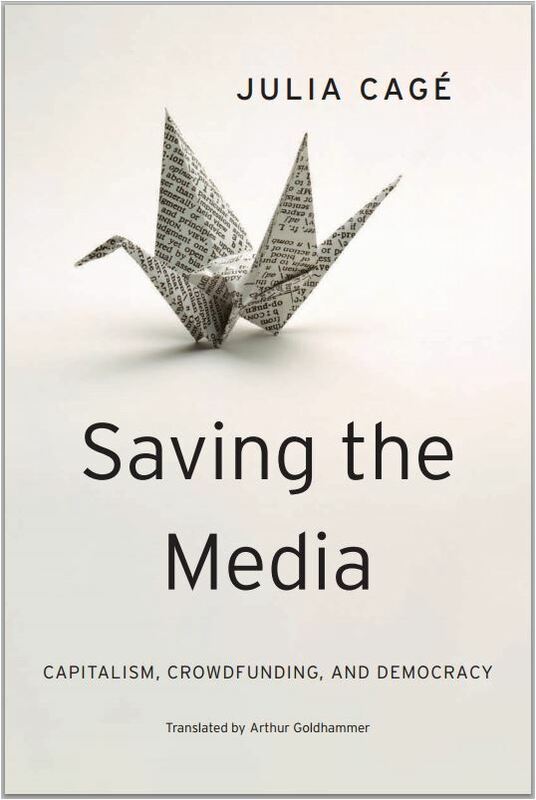 Order your copy of Saving the Media here. Disappointing because one of the main reasons for the decline in newspaper sales isn’t even mentioned – the fact that more and more people have discovered that they can’t trust the papers (or the major TV and radio stations) to tell us the truth about important matters such as national and international politics, the economy etc. They have discovered that the Internet is a far richer and more reliable source of information – when used with care and discrimination. When people discover that they are routinely lied to about crucial issues by the major news outlets (especially the BBC) they have a right to be angry and to switch off – or stop buying the papers. I could not agree more Paul. The media, including newspapers and tv outlets, just do not get it. They all think they can carry on with negative and biased reporting and expect the public to continuously pay into their self centred, capitalistic mind set. Time they all woke up and saw what is happening around them, disgusting! Seems to me that you and Paul have the right of it. Couldn’t agree more Paul. Taking you’re point further, what we are witnessing now is the media industry moving to protect what supporters it has. Right wing papers are becoming more right wing and publishing more ‘threats’ to their political ideology to strengthen the ties between the publication and the reader. It’s a case of scare the punter and they’ll become more loyal. It is true that the decline in the mainstream media reflects their support for the power structures of the status quo and the elites and the growing awareness by the majority of people that we cannot trust either. The non reporting of the forthcoming TTIP and TPP deals is one instance of media failure as is the non reporting – outside of Holland – of the recent Dutch referendum on the EU-Ukraiine affair. Everything that is vital to the the working of an open democracy is hidden. Peter Geoghegan, in the same article, notes that the Courier and the P and J have survived much better in the same environment. Both the Scotsman and the Herald aimed to become bigger players than they have traditionally been. There are parallels here with both the banks, RBS and BoS, and with Scottish football clubs. In all three areas, the result has been failure leading to downsizing; an excess of ambition, rather than a lack of it. What is remarkable about the SNP rise and bucks the trend, is that it has been achieved in the face of a hostile press and bbc. Conversely, labour’s fall in Scotland has paralleled the papers decline and the trust evaporating in the bbc. Trust is key, bbc, labour and papers do not have it, SNP has it in abundance. I’d like to know how that trust is built when the media is almost entirely against them? How is trust in Labour in Scotland so eroded when the media in Scotland is relatively for them, and how did Corbyn manage to get elected against such a hostile media? And how has Sanders done so well against an equally hostile media in the USA? Is it as simple as saying the internet is here to stay as a news source so the balance of power is shifting? In these NMOs – what payment is going to be made for the content creators e.g journalists, photographers filmmakers etc? If the model is the no-payment, HUffington post type arrangement, that is highly unfair. I didn’t see anything in the article that suggested the content creators were going to be paid in any way, and one of the reasons for the decline in quality journalism is that professionals are finding it hard to make a living at that. If the NMO doesn’t address this issue, then it will remain part of the downward spiral. I don’t know if Bella Caldedonia pays contributors? I don’t think The Canary does either, so it makes it just a hobby and can not really support long-term journalism. ‘uk is the world’s fifth largest economy’ – FACT! How do we know this to be true – because the media tell us so, every paper / station / channel, all the time. Well it’s not true, uk is sixth or eighth largest economy. uk is obsessed with how others view it, the so called special relationship, a toe curling example. The nonesense over one person’s ninetieth birthday this week summed up the uk, willing to ridicule others for bestowing fame and honour on their favourite sons and daughters, yet not seeing what the fame and honour it bestows on the English Royal family is as bizzare and cringeworthy as it gets. All this is facilitated and maintained through the establishment’s control and ownership of the media. Both tory’s and labour are part of the establishment, albeit, labour are used as a tool delivering the message to its constituency. Independence for Scotland is not part of the establishment’s game plan, hence the attack on the SNP = BAD, my fear is this manta becomes as accepted as the uk being the world’s fifth largest economy. Being an optimist, hope should overcome fear and Scotland’s people see the press and media for what it is, the right arm of the establishment! Much of what is wrong with the world is down to the interaction between human frailty and the structures of Joint Stock Companies. It is nice to see someone else experimenting with hybrid organizations that attempt to build these failings out of the system. More power to you. This is what we need, a diverse ecosystem of new ideas in company formation that can compete in a fair marketplace where natural selection will favour those better able to serve the greater good. NMO seems like a pretty good description of Wings over Scotland which is going from success to success via crowd funding. But then Wings is an excellent writer who actually does journalism as it should be done, used to be done a long time ago. Much truth in this. Things have moved on. The days of so-called news being smeared on lumps of tree with greasy black-stuff are slipping away, thank goodness, together with the awesome and often abused power of those who take money for their grubby business peddling bile, sensation, xenophobia and sleaze. To Hades with them. The world is now our electric lobster!